My uni-brow was replaced with perfectly contoured arches. I was nearly asphyxiated on hairspray fumes and my comb was firmly affixed in my knee sock. my all girl’s high school! Like peacocks, we strutted our stuff up and down those high school halls, not a hair out of place. Back then, my sister and I shared a bathroom and fought for space in front of the lone mirror. Makeup, brushes and hairdryers were all strewn haphazardly about the room. Oh what a difference 30 years make. With nobody vying for bathroom privileges, I have the luxury of displaying my things while not having to worry whether someone will try out my latest shade of neon blue eyeliner without my permission. (Yes, Colleen, I’m referring to you)! Here’s to a perfectly plucked brow, the most amazing shade of blush, the shiniest lip gloss and the perfect place to display it all. And most importantly, here’s to still realizing that we’re not doing any of it for the boys! « Previous: Southern Bloggers Conference Ticket Giveaway! What a great use of them wonderful finds and I bet they look great in your bathroom. 1983? *sigh* I was married. I may or may not have given up the purple eyeshadow. I have the important things on display too….. cotton balls, ear balls, face cleaning balls. The beauty products are all in the drawer. I’ve waited many years for the beauty part – I might want my money back. Hmmm, 1983.. yeah I was all over it too – purple eyeshadow and all! Cute post and love your tarnished silver. That is the best kind. Love the bathroom display. Funny how things change over 30 years. I can totally relate to your story. Love it! In 1983, I was getting married! no purple eye shadow for me. In 1983, I had a husband, two children and some sort of job. Being old though, my thought for your silver, I like that you are using it but please polish it. Love the silver containers!! And love the tarnished look. I still have my baby cup from the 50’s, I should bring it out and use it! And yes, it has that lovely tarnish, too. Such a cute post! Even though I was the only girl of 3 kids, we still had to share one tiny bathroom, and vy for time in there. Great bath organizers. Love that storage! It’s beautiful! All your necessaries look so cute in your little silver containers. Love that idea. I use some little green planters and ironstone cups to keep the countertop looking good. Isn’t that what it’s all about! I am so glad it’s not 1983 anymore! I found some great narrow file cabinet drawers yesterday that I almost brought home to turn into shelves for my bathroom. I guess sometimes I worry about having too much old stuff. Your post has me kicking myself for not getting them–really like your repurposed silver. 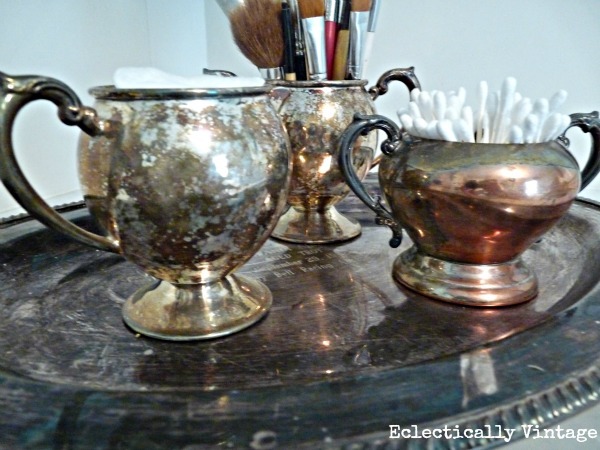 I love tarnished silver, so I love this display idea. How pretty! What a great idea and so creative! I have a 100% mid-century bathroom (on purpose), wonder what I could use similarly in there? Great use of the tarnished silver. Cute post, and even cuter vignette! Love the use of silver in this unexpected way! Fun stuff, as always. Love your silver and the way you are so stylishly using it to hold all your primping items. Your photos are great, I love your posts! You know I love tarnished Silver! This is so pretty. I just super adore it Kelly!!!! Super. Adore. It! Great idea for my miscellanious silver, looks great!! I am visiting via Savvy Southern Style. I love, love, LOVE the idea of silver in the bathroom! 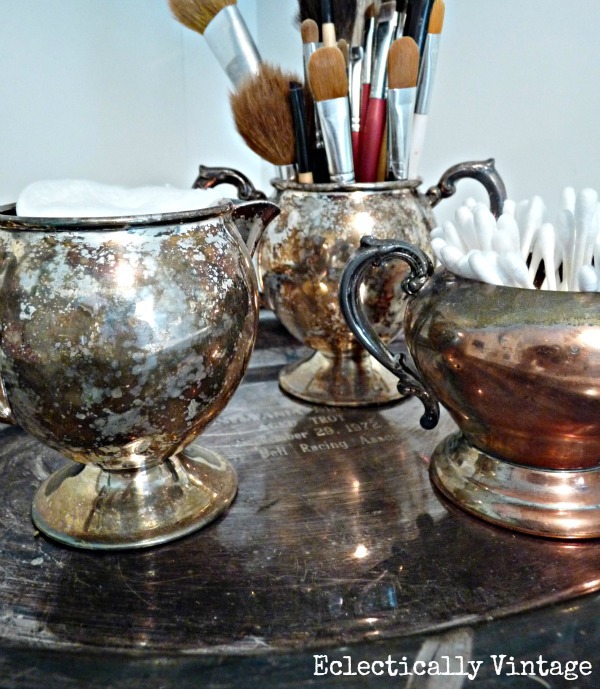 I love vintage silver anywhere, and your bathroom is no exception. Caute! I have all my bathroom stuff in sugars and creamers – only problem is I don’t have room for a shelf…..I’ve been mulling over what I can do but haven’t firmed up a decision yet. Mine are all glass, but I really like the silver. LOL! I can just see all of you gals strutting around with peacock colored eyelids! 🙂 As we get older, I think we really dress to impress other women. Men sometimes don’t even notice! 🙂 Love your pretties on your tray! Thanks so much for popping in to see me. Girl, I love your tarnished silver…and I must say your brows look good too:) Cute post Kelly. Excellent way to organize and a wonderful way to use that silver that we hardly ever get to use. I’m thinking I never got caught up in the blue eyeshadow phase … or perhaps I blocked this particular 80’s phase from my mind … but no matter the color, you make-up looks perfect in those tarnished silver creamers and sugarers! 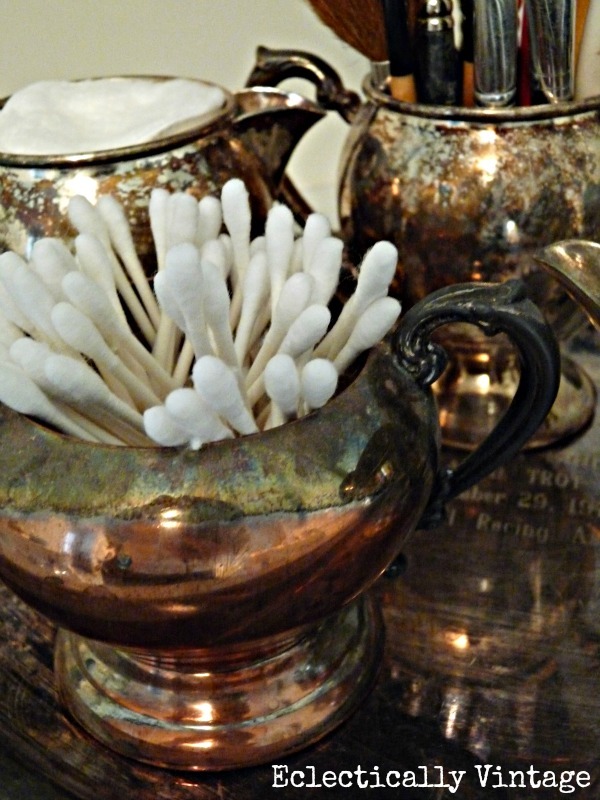 Who would have thought to use sugar bowls for bathroom makeup storage?! Oh, you did – and it looks great! I love the tray that the sugar bowls are sitting on too. I love silver but don’t have any in my bathroom. Going to work on that one. I love silver in the bathroom! Great idea! I loved purple eye shadow too! Lovely vignettes- thanks for sharing! I love tarnished silver too! No perfect shine for me. This is so pretty with the vintage silver, Kelly. I use pressed glass sugar and creamers to hold makeup items on my vanity in the bedroom, and they work very well for storage and are pretty as well, but you’ve given me some new ideas for additional storage for that area. 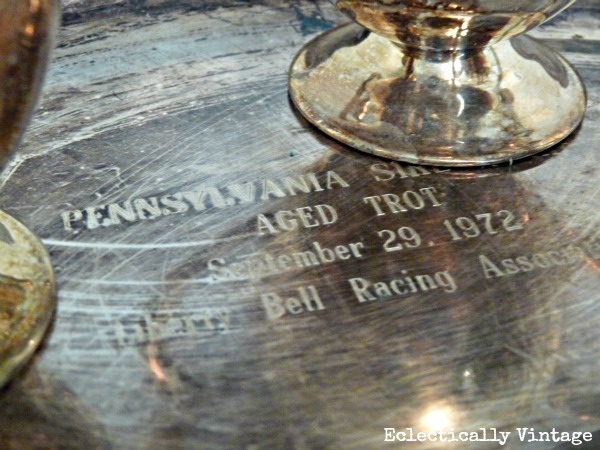 I love that your silver tray was a racing trophy–how cool is that?? What a fancy bathroom display…LOVE it!! Fabulous idea, Kelly! I love it! Love how you’ve displayed all your goodies Kelly. This sure does inspire me to drag out my silver and put it to good use! Kelly your post could have been describing me, except I went the bright blue eye shadow in 83 – lol… so relating. Love your vintage vignette. I’d love it if you would consider sharing this post at my Shabbilicious Friday. I love it Kelley!!!! I am in love with Silver and it seems people are afraid of it… at least afraid of using it! I love how you re-purposed these pieces! Pinning it!!! I love this post!! And silver in the bathroom…yes. I love love love vintage thrifted Silver Plate – Especially Tea Sets. 1983 – Graduated College and started climbing the corporate ladder. Permed Hair for sure. Love the way you stored all your goodies. Wonderful display. This brought back memories of sharing a bathroom with 2 teenage sisters many years ago. Love how you left the silver alone in all it’s tarnished patina. Great post! Love the silver in the bathroom. I have a vintage mirror tray I use for my makeup brushes and such, but I am thinking the little pitcher I have needs to be replaced with an old Silver one! PS I bet my bangs were bigger than yours. We should compare. I got mine straight and high! I like alternative uses for items. If you plan on handing down your silver pieces, however, best not to keep them in the bathroom or in other humid places.